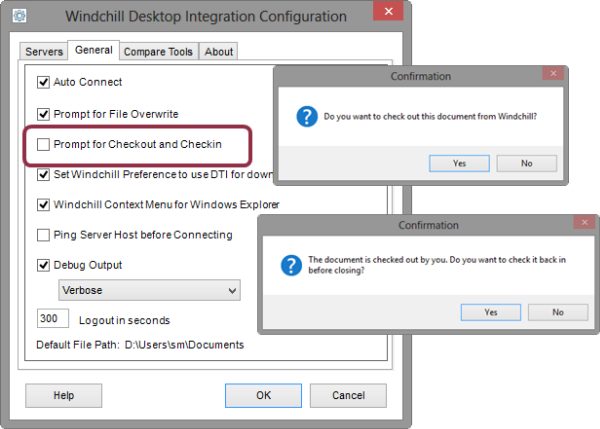 In PTC Windchill 10.2, users can control document checkout prompts and save local versions of Windchill documents. 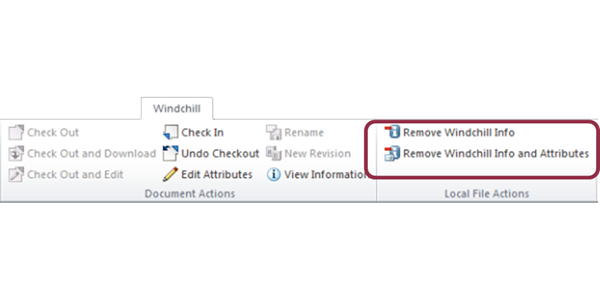 Remove Windchill Info: Save a local copy that Desktop Integration does not recognize as a Windchill document. Remove Windchill Info and Attributes: Save a local copy that Desktop Integration does not recognize as a Windchill document. This function also removes any Windchill properties and document attributes. Desktop Integration provides checkout and checkin prompts when a user opens or closes Microsoft Office documents. Users have the option to control whether or not these prompts appear. For more information, see the Windchill Desktop Integration topic in the PTC Windchill Help Center. Tip: Enter the topic name in the PTC Windchill Help Center search field to easily navigate to the topic. Users can control whether prompts appear when checking in and checking out documents. Two actions are now available that allow users to save a local copy of a document without Windchill information.